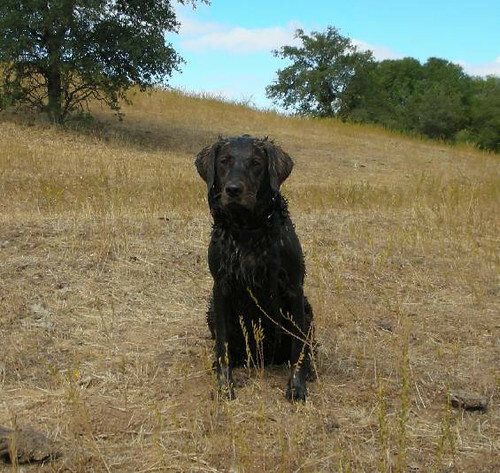 While doing some research on the history of wavy coated retrievers, I found a description of Don of Gerwn. Previously, I said that he was a black dog that carried the yellow gene. I was wrong. He is described as a “sandy liver,” which a dark gold dog. His grandsire, Lucifer, was a cream-colored dog from Tweedmouth’s strain. Don’s dam, Rust, daughter of Lucifier, is often thought of as an early golden retriever field trial champion (one of my golden retriever books claims her). Her color is self-explanatory– golden red. Dark colored dogs can carry the gene that produces pale gold puppies, which will make sense when you think of the color of yellow flat-coats. Don of Gerwn’s progeny would later be used in the development of a standard breed that became the flat-coated retriever. This piece comes from The Complete English Wing Shot by George Teasdale Teasdale-Buckell. If you read on to the next few pages, Don was lightly built and competed better against the heavier bodied wavy-coats, which were common in some lines of the breed. He was “easily” the winner of an early trial. This heavy body comes from the use of heavily bodied Newfoundlands– the ancestors of the modern Newfoundland dog– to produce new strains of the wavy/flat-coat breed, which became necessary when the smaller Newfoundland (St. John’s water dog) became rather rare after the Newfoundland government began to promote sheep farming over commercial fishing. The big Newfoundland was being hawked on the street as a fashionable pet at the this time. So it was used in some of those crosses. Again, the even big Newfoundland was much more retriever-like than its modern descendants, but it was not the same breed of dog used by fisherman in Newfoundland in the seventeenth and eighteenth centuries. The author argues for a body type more like Don of Gerwn and away from the heavily bodied dogs. Perhaps we should follow this advice. I mean these early retriever people knew a lot more about retriever working conformation than dog show enthusiasts! Quis and Don were being trialed just as a growing movement appeared to make the golden retriever a separate breed. Everyone with a brain knew that goldens were just a color variety of flat or wavy-coat, not Russian retrievers. And they were registered as such. Eventually, they were separated into different studbooks and registries. But black dogs carrying yellow genes still point to the common ancestry of the two breeds. This post has been corrected. However, it is likely that his dam was a dark gold dog, and his grandsire was a Tweedmouth dog. Therefore, he did carry the yellow color. on December 16, 2008 at 12:52 am Patti S.
While I see some yellow cast in rendering the highlights of the portrait, the dog is dark brown. Fairly close to the color of many of my liver FCRs. I’ve never seen him with color, but doesn’t he have a black nose and dark eyes? It looks to me like he’s a dark red dog, a mahogany, which we used to get in goldens more often. A mahogany golden looks almost like a His grandsire was one of the Tweedmouth dogs. I have a photograph of him, and I’m not convinced that he’s as liver as this painting suggests. Even if he were a liver genetically, he would still carry the yellow color. I’d really like to see an in color photograph. All I have is a painting, which can be embelished, and a black and white photo. Have you seen a mahogany golden? I had one born in a litter when I was growing up. He was very dark. I think he may have been one of these dogs. George Teasdale-Teasdale Buckell’s description of Don of Gerwin is of a sandy liver color. This dog here would be a sandy liver or an mahogany. I personally would have a hard time telling this from many liver flat-coats, especially if this dog had a brown nose and light colored eyes. And this was one of the problems during the separation. The Culham line of goldens, which is a founding line, were heavily interbred with black flat-coats. When the separation happened in 1911, littermates were placed into different registries. This line tended to be dark gold, red, or mahogany in color, so I doubt that most yellow flat-coats, which are usually lighter in color, are descended from these lines. However, it is possible. Whereas the dog that was said to be in Don’s ancestor was a light gold (“cream colored” but not what we mean by that color today) dog. This would explain why his progeny were often yellows. Is the English/Irish champion a descendant? He was a heavily used dog. I have two golden books that count Don as a golden, rather than a flat-coat. One of them is by Valerie Foss, but the title slips my mind (it’s on goldens) and the other is by Marcia Schlehr. To tell you the truth, I think the golden people were idiots for separating the breed off just because it was of a different color. When the two were the same breed, the golden went through the exact same changes in type that the flat-coat did. I even had a nice dark golden that would’ve been a very good looking flat-coat, except she was tawny in color. Several goldens were sold as liver flat-coats. on December 16, 2008 at 2:53 am Patti S.
I copied the image of Don from the link above and enlarged it. His nose is painted with dark brown paint. Liver flatcoat’s can have very dark eyes, although not as dark as some black flatcoats. In the black & white photo you’ve mentioned (in the Teasdale Teasdale-Buckell book and the Seall book, Don of Gerwin’s muzzle is greying, and that would make his nose look quite a bit darker. I just sent you the link to the Buckell book! I had a golden that looked exactly like that. The one I had was almost exactly like a flat-coat, except for color. One her whelps was even darker, approaching that of a mahogany. The mahogany color is almost gone in goldens, but an early dual champion golden, Dual Ch. Balcombe Boy, was a mahogany. This color is such a dark red that it appears almost like a liver. The dog in the picture I sent, was only approaching that color. These dogs even lacked cream-colored breeches that you usually see in dark goldens. The truth is I don’t know which color Don was, but I do know that he at least carried the gene for yellow. I’ll go with your suggestion that he was a liver carrying yellow, but Valerie Foss, of golden retriever fame in the UK, says he was golden. But he did carry the yellow gene. His grandsire was a Tweedmouth dog, and his dam may have been a real red gold dog. She was said to be the color of a rusted nail. Foss suggests that we shold count Rust and Don as goldens, because of the confusion that existed in color in those days. Several golden fanciers got their founding dogs thinking they were getting liver flat-coats, but they were actually getting dogs of the golden genotype. BTW, do you know anyone who breeds this type of golden on purpose? Because even in field lines of golden, there is a tendency to breed in lumber and coarseness that the George Teasedale-Buckell hated. I have a book on working Labradors that laments this tendency in that breed as well. I’m almost willing to give up goldens for good, and start anew with flat-coats as working dogs. I’m going to do an updated post on Don of Gerwn within the next day or so, but I’m right now working on the possible linkage between the Murray River Curly-coated retriever and the extinct Norfolk retriever. Thank you for sending me those links. The owner of that dog comments regularly on this blog. He has a very interesting breeding program. I think he has the only intact yellow flat-coat in the country.